Georg Wilhelm Pabst was not only one of the great German directors of the silent film era, he (along with Fritz Lang) explored the expressive possibilities of sound in the early days of sound cinema. 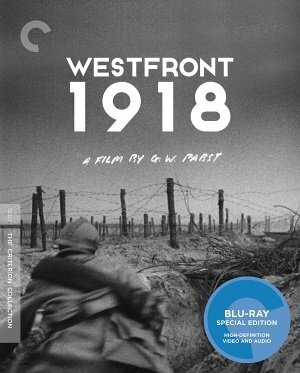 Criterion presents two of his earliest sound features, a pair that make perfect companion pieces: Westfront 1918 (Germany, 1930) and Kameradschaft (Germany, 1931). He tackled World War I for his debut sound feature Westfront 1918, an anti-war drama about four soldiers in the trenches of the western front in the final months of fighting. In the tradition of the platoon drama, they represent different types—the young Student, the hearty Bavarian, the protective Lieutenant, and the married man Karl (the only one to be called by name)—and have bonded as friends under fire, but the film chronicles the way the war grinds them up and leaves them dead or broken. It’s adapted from the novel “Four Infantryman on the Western Front” by Ernst Johannsen and looks as if it could be Germany’s answer to the much more expensive and expansive Hollywood production All Quiet on the Western Front from Lewis Milestone, based on another novel by a German author. In fact they were in production at the same time and released just a month apart.